Linda must be shown in her costume for Act II, scene 1, because in her other appearances she is dressed as a bride, in white. She sits with Rose, and has ominous thoughts. Left on her own, she sings a recitative, "How gentle was my slumber, / Ere tasted love's first kiss..." and an air, "Streams are flowing / Stars are glowing." 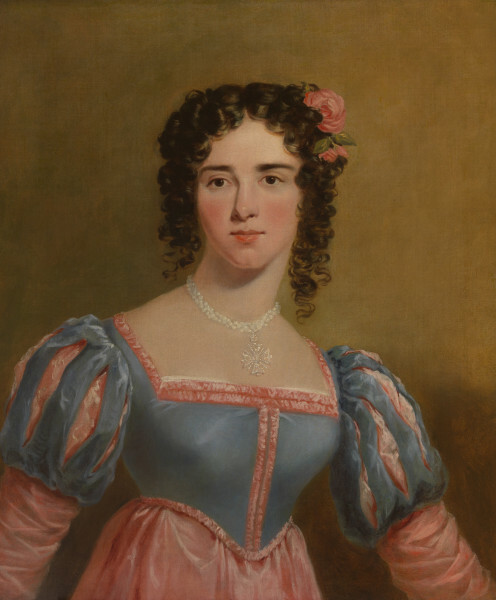 Miss Graddon, half-length, wears a pearl necklace with a pendant Maltese Cross, and 'Tudor' costume: a green bodice and puffed shoulders slashed to reveal pink undersleeves; her skirt is pink, and the bodice is trimmed with pink ruching. Weber's opera, with a libretto by Johann Friedrich Kind, was first given at the Schauspielhaus, Berlin, on 18 June 1821. The first London performance was at the English Opera House on 22 July 1824, with the libretto translated into English by W. McGregor Logan and music ‘adapted’ by W. Hawes. The opera was performed at six London theatres during 1824. The first Drury Lane performance was given on 10 November 1824, with a text ‘altered from the German’ by George Soane and additional music by Sir Henry Bishop. Miss Graddon played Linda. The opera was given in Italian at Covent Garden in 1825 with recitatives by Costa to replace the original spoken dialogue.